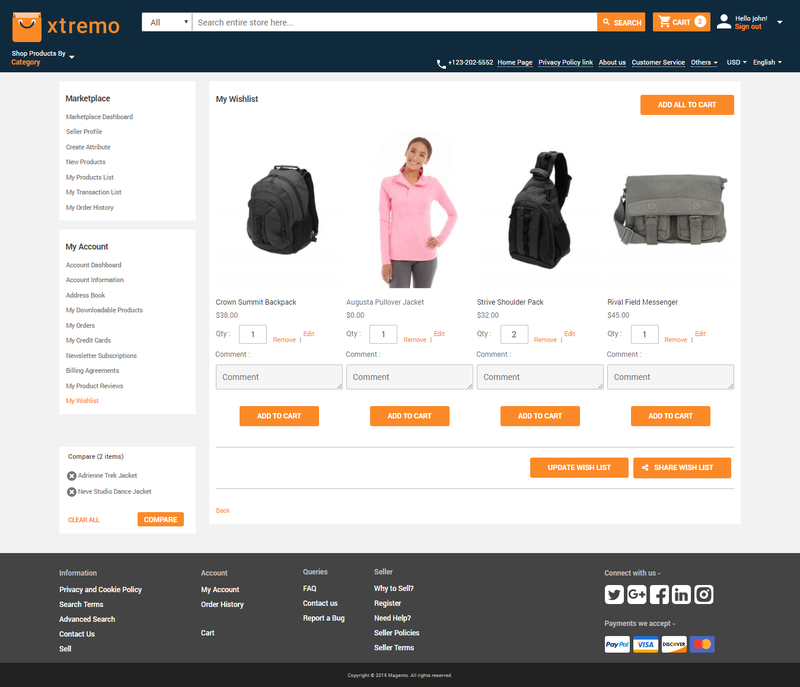 Xtremo is a premium theme for Magento 2 store. The theme is responsive, beautiful, and customizable. The theme is suitable for any type of store including the Marketplace. Xtremo theme has various built-in features – mega menu, banner slider, four Types of product carousels, custom header links, social media links in the footer, popular categories, marketplace banner, and much more. The Xtremo theme looks amazing on any type of devices – desktop, laptop, tablet, or mobile. Due to its responsive nature, the theme will adjust itself on any device resolution. Responsive to every device resolution. Show the multi-image banner slider with embedded URL. Product carousels – featured, discount & sale, top- rated, tailored. Add mega menu category background image. Select categories for product search. Add social media links in the footer. Popular categories images on the homepage. Show accepted payment options in the footer. Upload default placeholder image for the category. Customize homepage using various CMS blocks and widgets. Works very well with Magento 2 Marketplace. 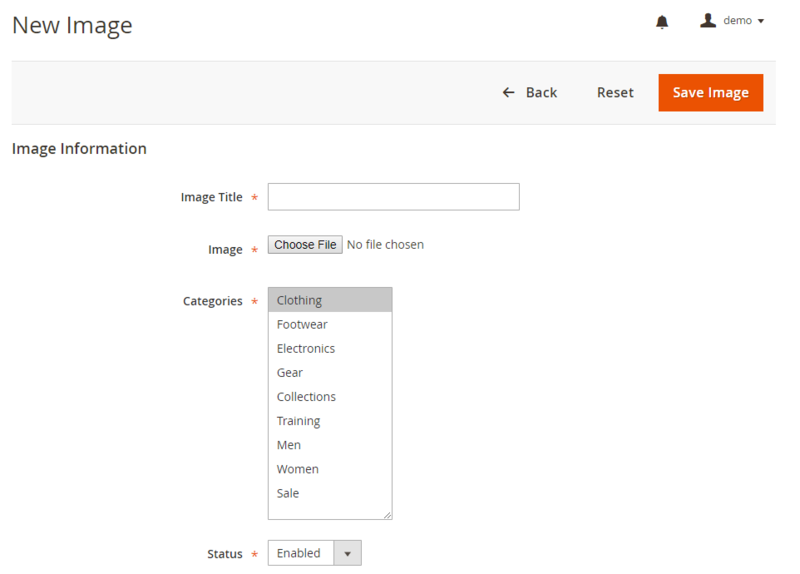 After extracting the downloaded zip file go to src>Theme-files and upload app folder to the Magento root directory. 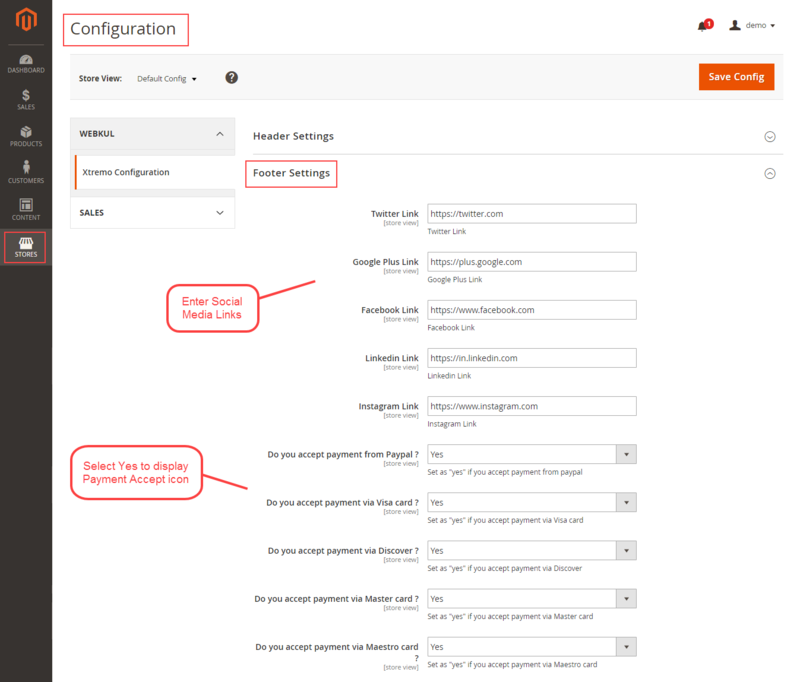 If you have installed Magento 2 Multi-Vendor Marketplace extension, then follow this step otherwise skip it. (a) For Marketplace version 2.0.9 and below, open Marketplace-patch folder and move the app folder into your Magento root directory. (b) For Marketplace version 2.0.10, open Marketplace-patch(2.0.10) folder and move the app folder into your Magento root directory. (c) For Marketplace version 2.1.x or newer, open Marketplace-patch(2.1.x) folder, and move the app folder to your Magento root directory. For Multilingual support, please navigate. Store>Configuration>General >Locale Options. And select your desired language from the Locale option. If you need to do the module translation, please navigate the following path in your system. app/code/Webkul/Xtremo/i18n. Open the file named en_US.CSV for editing as shown in below screenshot. After editing the CSV file, save it and then upload it to the same folder. Now your module translation is complete. 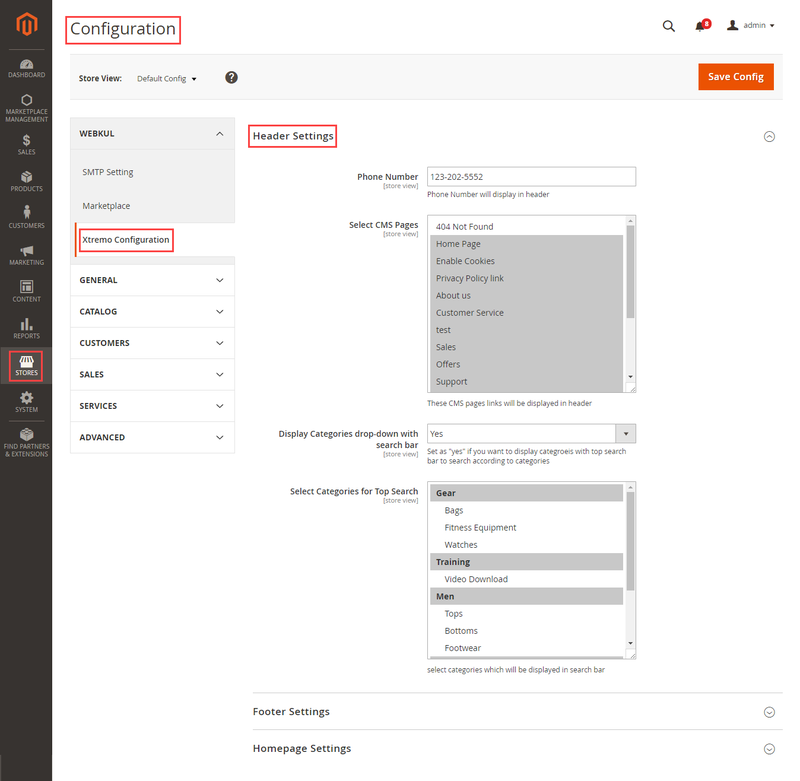 After the module installation, the admin needs to go the Xtremo configuration. Go to Stores>Configuration>Xtremo Configuration. The following page will appear. Phone Number – Enter the store phone number to show on the header menu. Select CMS Pages – Select which store pages link to show on the header. 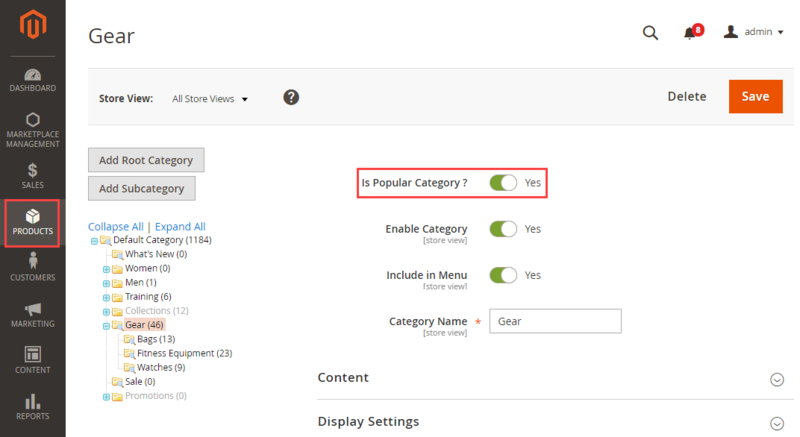 Display Category Drop-Down Search Bar – Select Yes to allow customers to search according to the categories. Select Categories for Top Search – Select which categories will appear in the drop-down search menu. Add social network links at the footer. The store owner can add external links to the social network like Twitter, Google Plus, Facebook, LinkedIn, and Instagram. Also, can show accepted payment options like Paypal, Visa card, Discover, Master card and Maestro card. Category Placeholder Image – Upload default placeholder image for the categories which have no image. After installation, the Xtremo theme will be set as the default theme of the store. But to apply any other store theme, please go to Content>Configuration, the following page will appear showing all the stores and store views. Click Edit for whichever store or store view you want to apply the theme. To apply global view click the Edit. After clicking Edit, select any theme option from Applied Theme drop-down list. The admin can customize the homepage and footer content of the theme using the following blocks. Go to Content>Blocks, and select and edit the block as visible in the screenshot. For editing footer section links, title, and text, select and edit Footer Links Block. Click Show/Hide Editor and edit the HTML. Edit the block title, set URL Key and label for nav item. 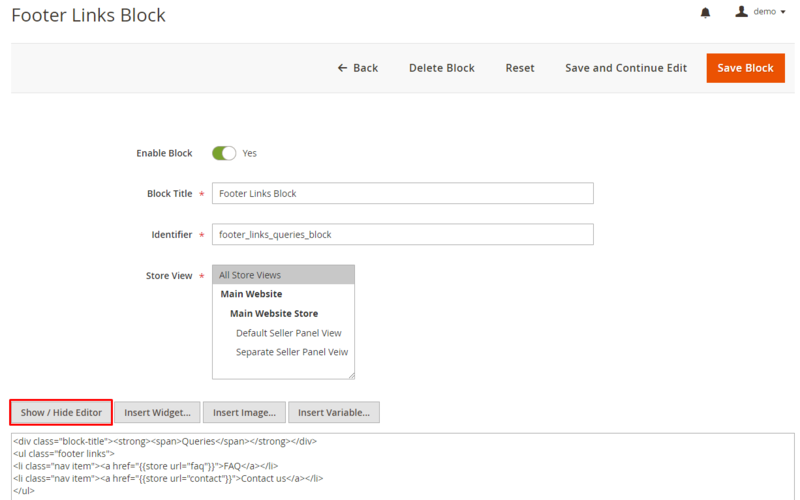 For editing the URLs, title, text of Footer Links Seller Block select and edit this block. Click Show/Hide Editor and edit the HTML code. 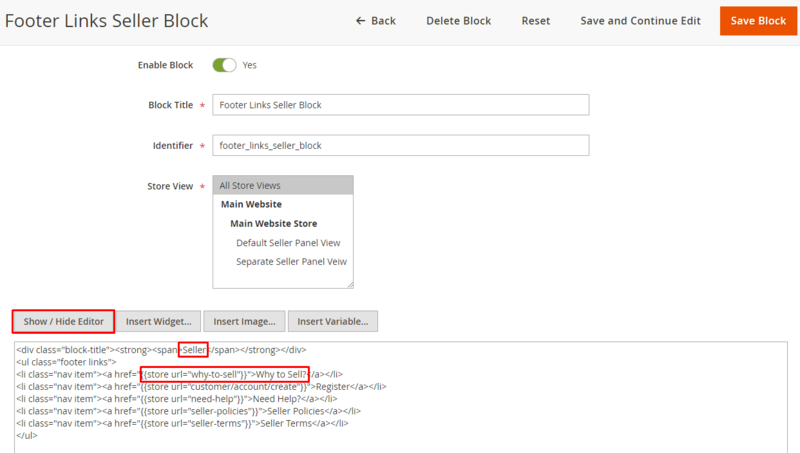 Once you have made the changes, you can see the seller footer block section updated. If you are using Xtremo theme with Magento 2 Multi-Vendor Marketplace, you can see the Xtremo Homepage Sidebar Block on top. Here you can show any links to CMS pages. 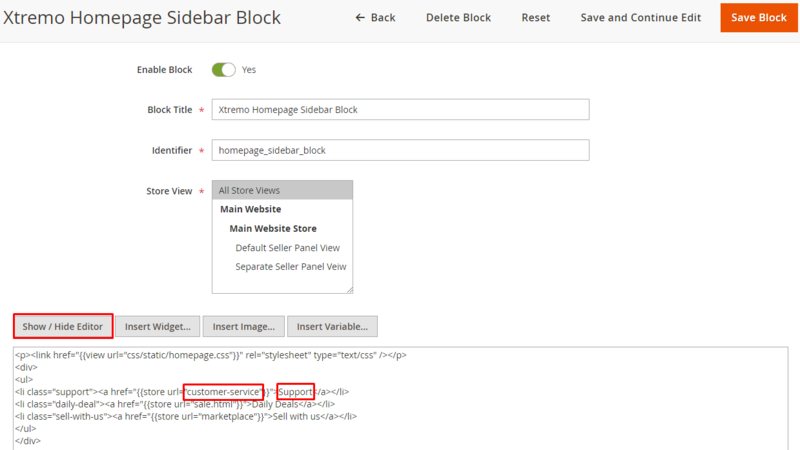 For editing the Xtremo Homepage Sidebar Block, go to Content>Block>Xtremo Homepage Sidebar Block. Select, Edit, click Show/Hide Editor and make changes in the HTML. Under product carousel, you can display three static banners (1 large and 2 small) on the Xtremo homepage. You can also customize the banner labels and add URL as well. 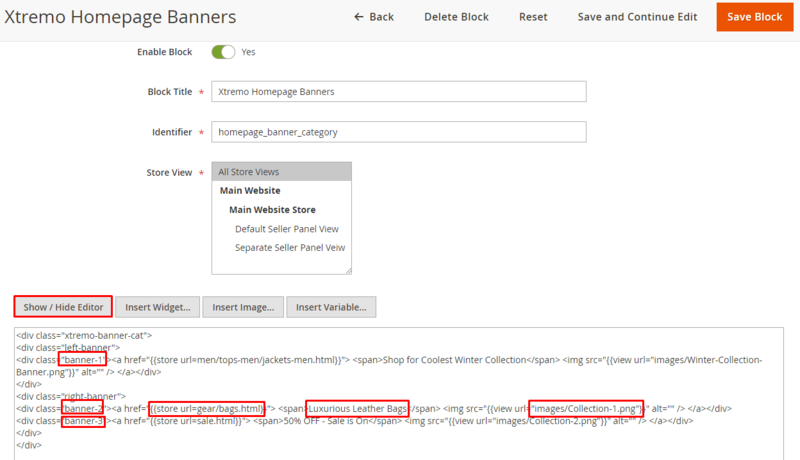 For editing the Xtremo Homepage Banners block, go to Content>Blocks>Select and Edit ‘Xtremo Homepage Banners’. Now edit the HTML code. On the homepage, you can see the banner slider with ‘Buy Now’ button. You can use this space for displaying multiple banner images. Further, you can customize the banner using title and some text below. For editing the Xtremo homepage slideshow, please go to Content>Blocks>Xtremo Homepage Carousel Images and edit the HTML. Set h2 title, enter text in h4, add store url for Buy Now button. Set Buy Now label (optional) and enter image url with alt information. 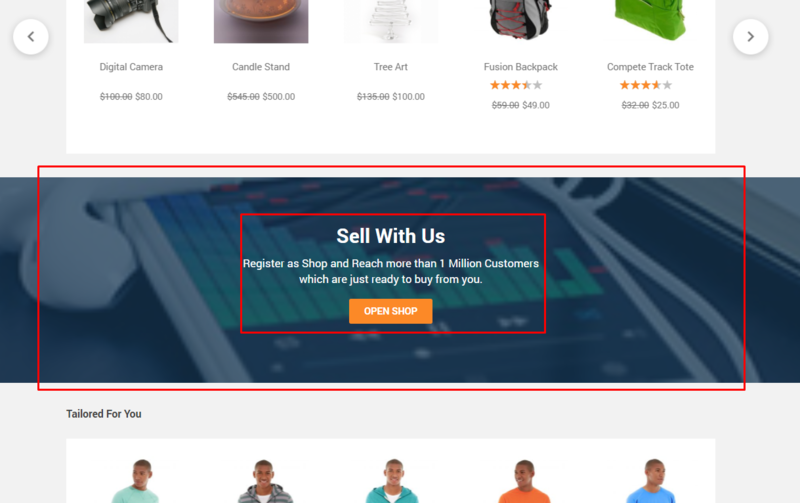 If you are using Magento 2 Multi-Vendor Marketplace, you will see the Xtremo Homepage Marketplace Block on the storefront. To customize the widgets of the Xtremo theme, go to Content>Widgets and edit following widgets. Go to Products>Catalog, select and Edit any product. The following options will be visible, select Yes to include the product in the carousel, else select No. After installation, this module automatically selects and enable five random categories as default popular categories. The admin can enable/disable these popular categories by setting the Is Popular Category? option to Yes/No by navigating to Products>Categories. For uploading popular category images go to Products>Categories open any category find Popular Category Image option in the Content section. To manage the background images for the Mega Menu, please go to Xtremo>Manage Category Banner Images>Add Image for Banner. The admin can use the Actions to change to image status as enabled, disabled or delete the image. After clicking the Add Image for Banner button, the following page will open. Enter the title, upload image file, select the category, and then select status as – enabled/disabled. This is how homepage will appear on the front-end. 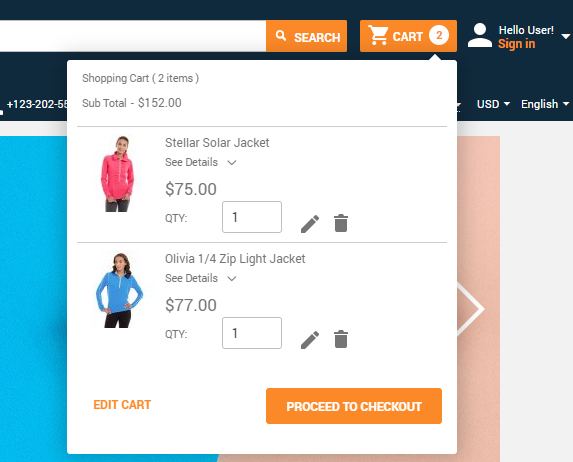 The homepage will show the banner slider, header links, category menu, various product carousels, and popular categories of the store. The customers can browse the categories using the amazing mega menu. Just hover the mouse cursor and it displays the sub-menus. All the parent category will have an image also. Show multiple images using the responsive banner slider. Each image can have an embedded URL for visiting a page. 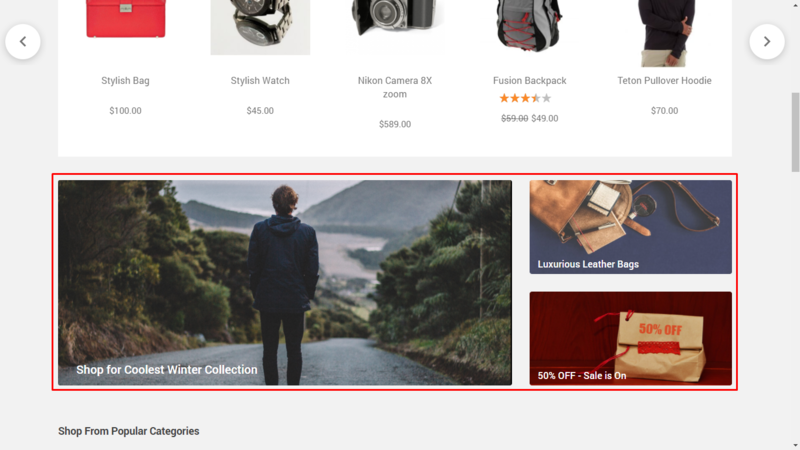 The customers can use the arrows for viewing all the banner images. The banner slider adjusts its size according to the resolution. Xtremo theme includes 4 types of product carousels. Display featured products, top-rated products, discount & sale products, and tailored products on the homepage. 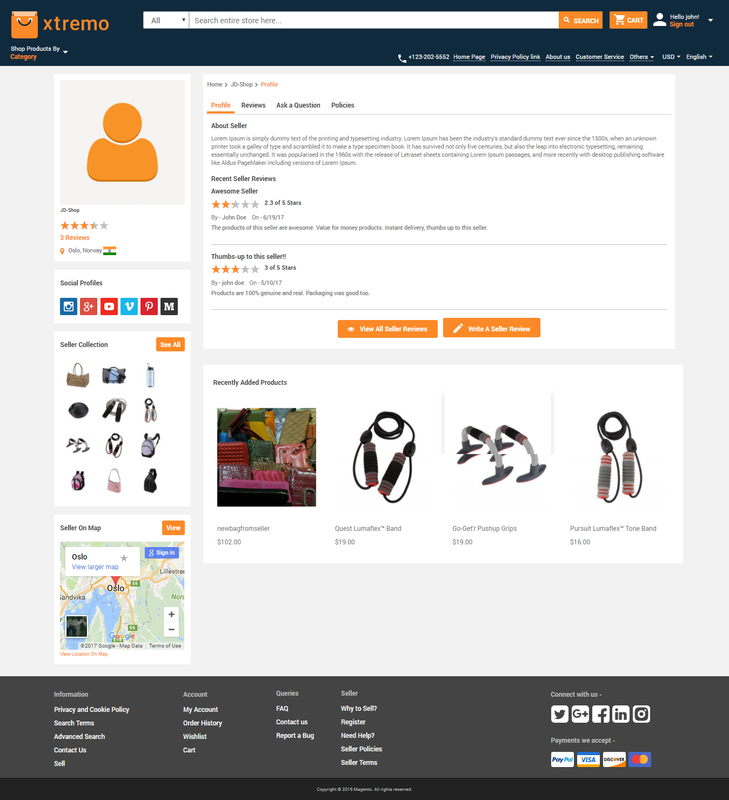 The category page showing various products in grid view layout. The customers can use filters and sort by options for searching the products. Advanced layered navigation allows the customers to find products easily. The customers can view the category in list layout for more detailed product information. 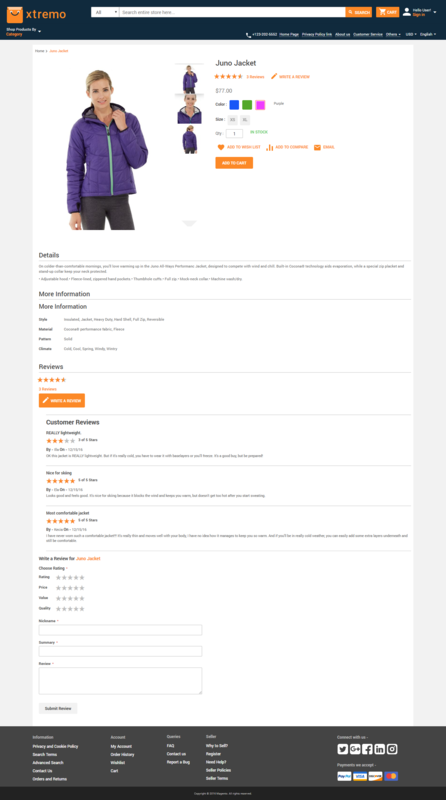 The product page is completely redesigned, the customers can view product information, reviews, images, and, ratings. The customers can do the comparison between the two or more products of the store. Following is the product comparison page. Here’s the customer wishlist page, the customer can edit the quantity, add the product to cart, update wish list, and share the wish list with friends. The customers can also add a comment for their wish list products. After adding products to cart, the customers can click the cart button from any page and view the item details. The cart button also shows the number of products added to cart. The shopping cart page of the store showing summary for shipping and tax. Here is the Login and Sign Up page will appear for the customers. 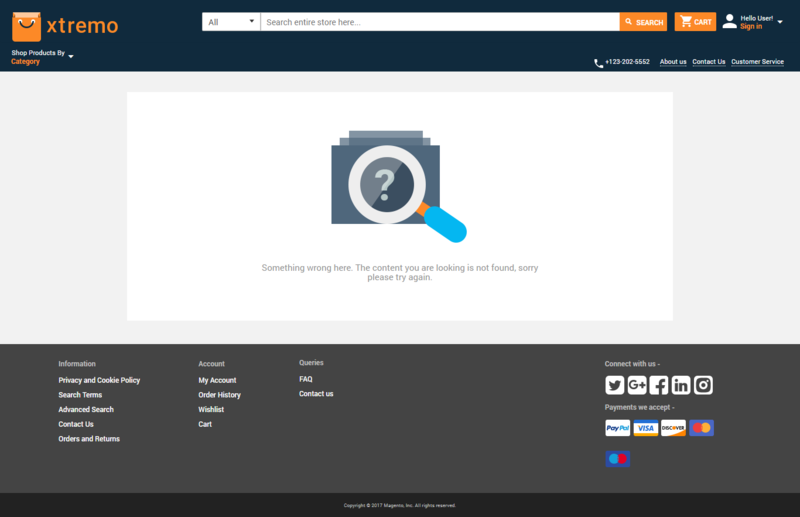 When a customer searches for anything on the store and nothing comes up the following page will appear. 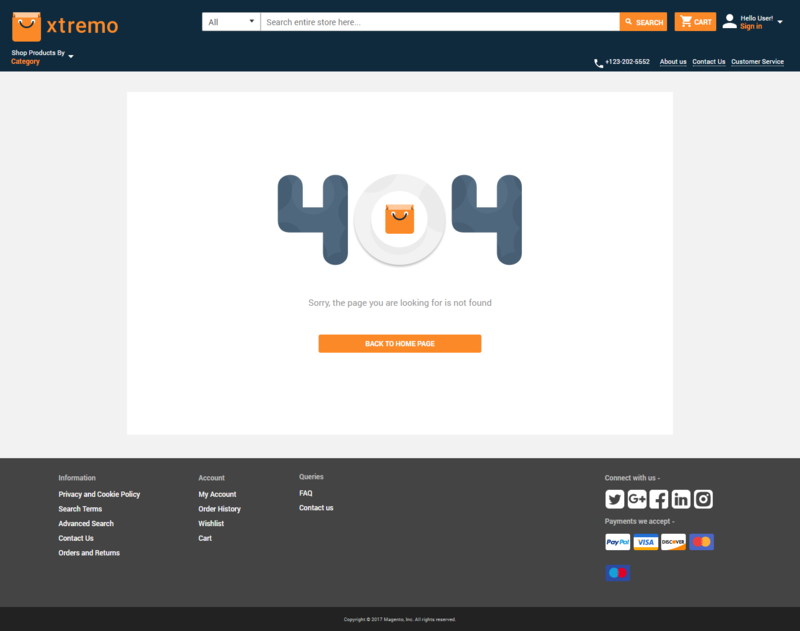 This is how 404 error page will appear when any web page is not able on your website. 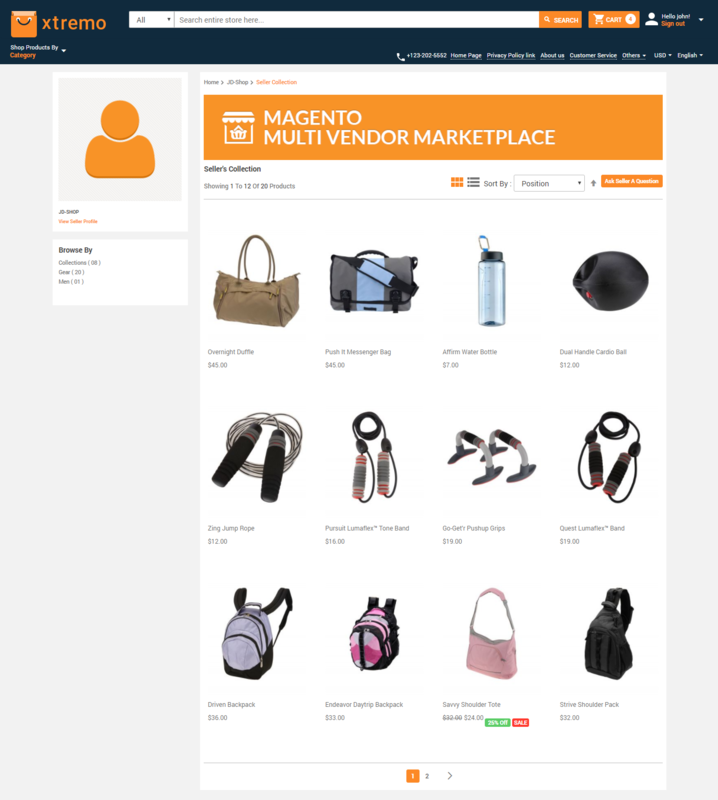 The Xtremo theme for Magento 2 works very well with the Magento 2 Multi-Vendor Marketplace. Please view the following screenshots to see how the marketplace will appear in Xtremo theme. Important Note – Make sure you have uploaded the Marketplace-patch in the Magento root directory. Please refer to Step 2 of the installation. The seller profile page showing lots of details about the seller. Seller collection page is there for viewing all the products of a seller at one page. 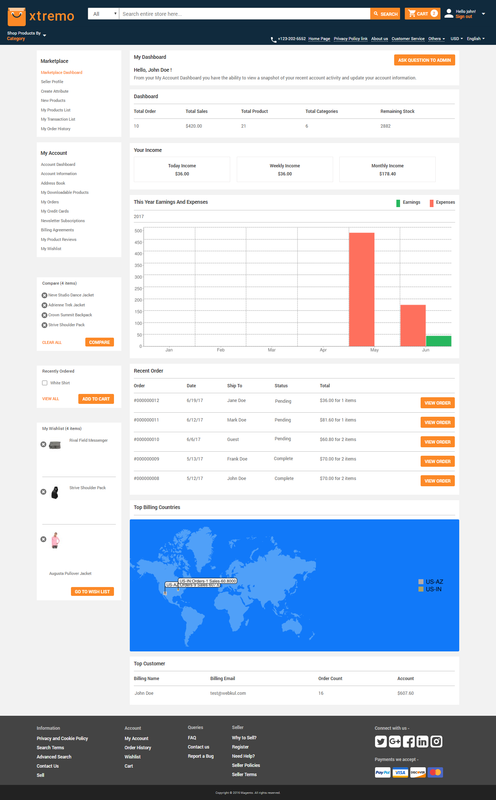 Amazing looking marketplace dashboard page for the sellers showing all the basic information about their store. The Xtremo theme is compatible with all the devices resolutions. The layout, banners, carousels, menu, and everything adjust itself according to the viewing user device. I have purchased the extension https://store.webkul.com/magento2-multi-vendor-marketplace.html, with which I got this theme free. Exception #0 (InvalidArgumentException): Webkul_Mpxtremo composer.json error: Unable to unserialize value. Please send create a support ticket here – https://webkul.uvdesk.com/en/customer/create-ticket/ and mention your FTP/Admin/Order Details. Your issue will be resolved soon. Can Xtremo Homepage Carousel Images be played automatically? 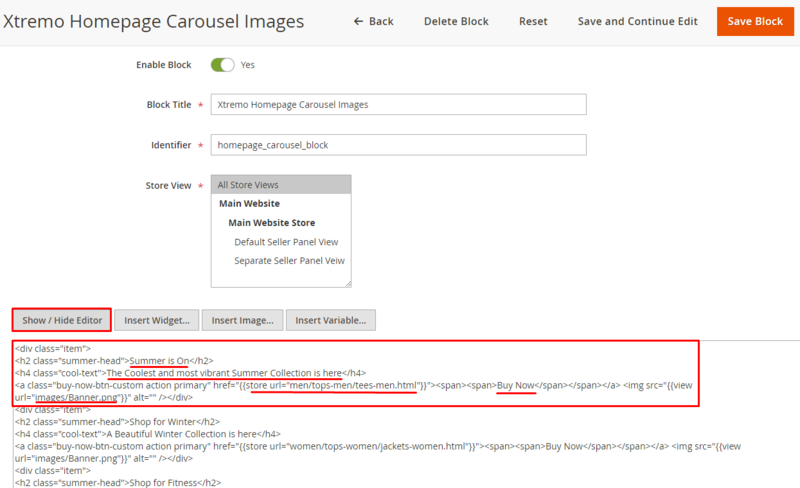 The Xtremo Carousel Images can be moved using arrows, but not automatically. If you wish to have this feature, this can be done through customization, please email to support@webkul.com.